Local labor leader Andreas Cluver and long-time community leader Arabella Martinez have been appointed to the Oakland Board of Port Commissioners. They join the Board February 11. 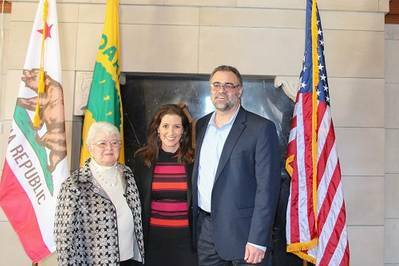 Nominated by Oakland Mayor Libby Schaaf, the City Council appointed Cluver, Secretary-Treasurer of the Alameda County Building and Construction Trades Council, and Martinez, Vice-Chair of the Latino Community Foundation Board of Trustees at its meeting February 2. Port Commissioners Cluver and Martinez were sworn into office by Schaaf. Cluver's experience includes positions as Secretary-Treasurer, Alameda County Building Trades Council; Program Director, AFL-CIO, Southern Africa; and Compliance Officer, Northern California Electrical Construction Industry. Martinez’s experience includes positions as Founder aNd first CEO, Unity Council, Oakland; Assistant Secretary for the Office of Human Development Services, U.S. Department of Health Education and Welfare; and President, Center for Policy Development, Oakland, Calif., and Washington D.C.